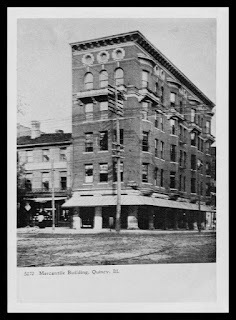 DERON JOHNSON OF Maine Street Magazine did a story for the October edition about our Fifth and Maine building. It's very well done and we appreciate the love for our little slice of Q-Town history. We have copies in the store or you can go online and read the entire edition, our story is on page 12. We are careful about who goes up into our historic structure. When we first got into the building I used to take people up there all the time. But past the third floor it's not in very good condition and it's a liability at best, so for the most part we are happy to just tell people about our amazing space. 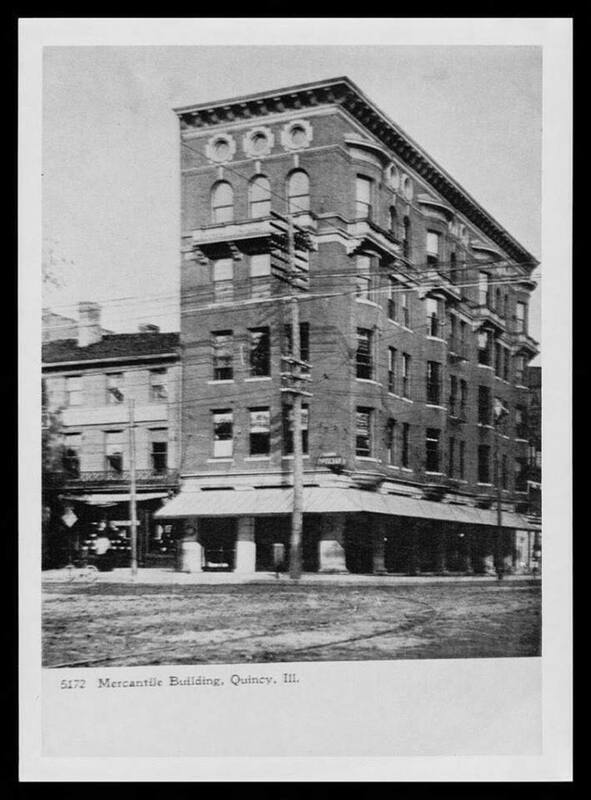 I love finding old pictures of our building, especially the ones pre-1920 before the north addition was added. This photo from the Illinois Digital Archives is way cool ... check out the signs in the windows, and the guys hanging out and lounging against the building on the Maine Street side. The there's this photo to the right, sent to me recently by a friend, taken from the ground level, and again before the building expanded. I love how history is all around us. Last Saturday I took a tour through Woodland Cemetery and we had some great re-enactors and stories to tell. Near the end I couldn't resist showing my group Dr. Koch's boulder grave marker - he was married to the woman who constructed our building, Hattie Dodd. I don't think it ended well. Oh, the stories that could be told! Again, thanks to Maine Street Magazine for the great story, and we are honored to keep a piece of Quincy history alive and well.